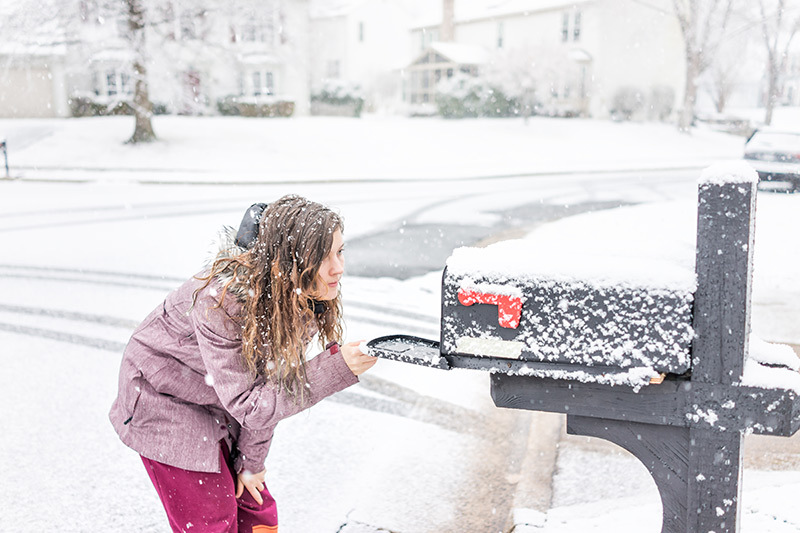 When it comes to getting your mailer in the mailbox, 90% of our customers want it ASAP! Our job is to proof, print and mail the piece as quick as we can so our customers' mailings are delivered as soon as possible. "We want our Christmas mailer to arrive sometime between November 26th and November 30th. Our sale window is December 1st to the 8th, and we really would prefer not to have it arrive earlier than Thanksgiving." In the good old days, the USPS used to stage and deliver marketing mail (formerly referred to as bulk mail and then standard mail) with an option for "in home date" windows. Unfortunately, that option was discontinued in 2011. We've seen local marketing and non-profit mail get delivered the next day, though often the delivery dates vary based on point of entry, distance to recipient and other factors. The published service window for marketing/non-profit mail is 3-10 days, as detailed in the map below. 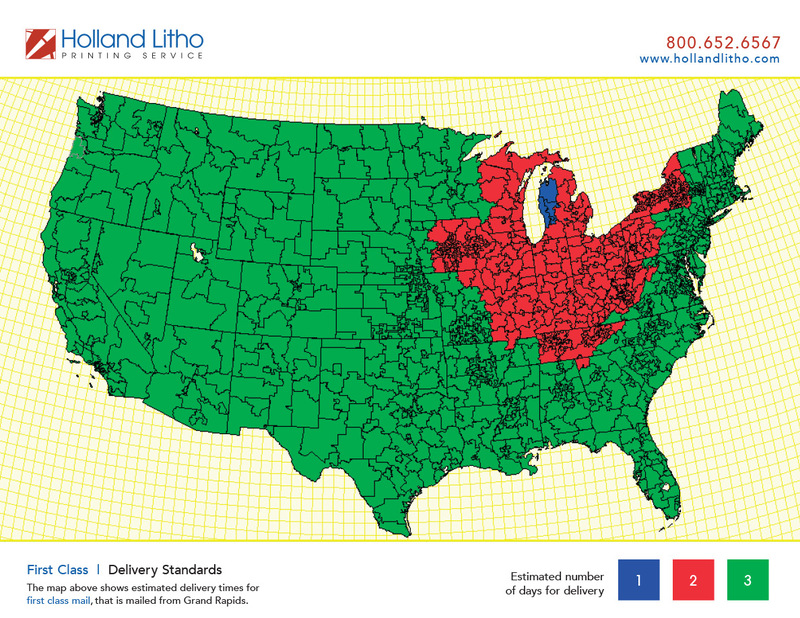 In contrast, the published window for first class mail, the second map, is 1-3 days nationwide. We generally recommend using non-profit and marketing mail, especially for local direct mail campaigns, because of its quick delivery under normal mail-volume circumstances. With rates that can be nearly 50% lower than first class delivery, you have a great deal of incentive to use these options—if you can. However, during busy seasons (holidays, political campaign season, etc. ), delivery timeframes can be much slower, with pieces taking as little as a few days or as long as 10 days or more to deliver. This can create complications that are harder to manage and introduces some uncertainty into a mailing strategy that relies on in home windows. First class can help with quicker delivery in a tighter window, especially if its a broad geographical area. In a situation where you need arrivals within a specific window, we can help you understand best and worse case arrival times and the trade offs to expect with first class vs. marketing/non-profit mail. Bear in mind, though, that delivery dates can't be guaranteed. We can, however, help you understand what to expect in your specific situation. 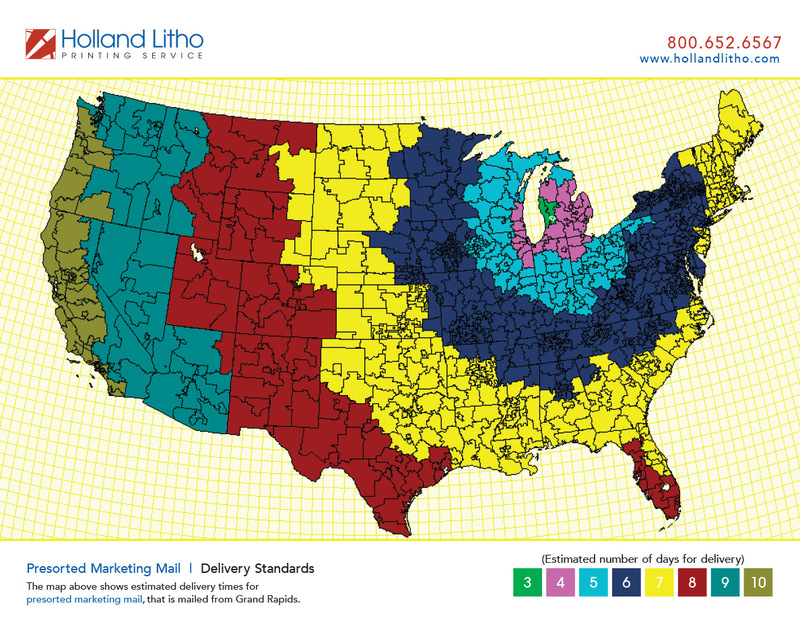 As you can see, marketing/non-profit mail is a good option for local direct mail with tight delivery windows, as well as regional and national campaigns with a wider delivery window. If you opt to mail first class, the delivery window tightens, with a 1-3 day window for all mail, vs. a 3-10 day window for marketing/non-profit mail.